Since their discovery, essential oils are known as a hugely valuable resource to treat a variety of infections due to their multiple biological functions, especially their antimicrobial, and antioxidant activities. Unfortunately, these volatile compounds have also certain limits such as the processes for extracting of these oils, the purification of their bioactive molecules and their minimal amount. For that reason several scientists have been oriented their research towards synthetic molecules as a new tool to overcome the progression of many chronic diseases (cancer, fibrosis, cirrhosis, arthritis). The prime focus of this work was the synthesis and characterization of four α-aminophosphonate derivatives 4(a-d). Then we evaluated their antioxidant activity against oxidative and nitrosative stress. The in vivo experiments are conducted using Tetrahymena protozoan treated with IC50 of hydrogen peroxide (H2O2) or sodium nitroprusside (SNP); finally we checked their antioxidant behavior in vitro through DPPH and DC assay. The results of this paper confirmed that under the both conditions: in vivo and in vitro, two derivatives among the four synthesized possess an antioxidant activity; it is the 4a and 4c products. This project is an attempt to obtain new organic compounds that have the potential to be developed as new therapeutic agents. α-aminophosphonates, Stress, Tetrahymena, In vivo, In vitro. Nowadays α-aminophosphonate and their derivatives are used broadly in several applications: from agriculture to biomedical research. These organophosphorus compounds are well-known by their multiple biological properties including antifungal, antiviral, herbicidal, antitumorale, antibacterial effect [1,2] eventually they are used in biomedicine as synthesis inhibitors, due to their mimetic potential to substitute natural amino acids. Moreover, these synthetic products regulate some pathophysiological phenomena by inhibiting and perturbing the growth of some organisms such as: human immunodeficiency virus (HIV) and tobacco mosaic virus [3,4]. Besides these biological activities discover half a century ago, they possess also a great antioxidant activity, and an impressive ability to quench the overproduction of ROS and RNS [5,6]. These free radicals play an essential role in our body, especially to maintain respiration and homeostasis process; Furthmore these reactive species can regulate the autophagy in some organisms such as yeast, nematodes and eukaryotes [7,8] however, their accumulation undergo histological lesions (necrosis or apoptosis), cellular injury, and mitochondrial damage that causes several chronic diseases for example: cancer, neurodegenerative diseases, fibrosis, cirrhosis . In this work, we tested for the first time the antioxidant activity of these compounds in vivo using Tetrahymena cells as an experimental model. This protozoan is ubiquitous in various fields such as biochemistry, biomedicine, microbiology and ecotoxicology . This freshwater protozoan is considered among the protists who occupy an important place in scientific researches because it can be easily grown in a small volume of culture medium [11,12]. It is defined as a biological indicator of water quality. It is a eukaryotic system that offers to us a good chance to understand several cellular, physiological and biochemical processes: cell division, phagocytosis, movement, signaling pathway [13,14]. Otherwise, this protozoan is used as a new tool to screen novel biological activity and to evaluate the toxic effect of some xenobiotic drugs. The toxic effect of these substances exhibits the changes in morphology, metabolism, growth and other toxicological biomarkers detected in Tetrahymena cells [15,16]. 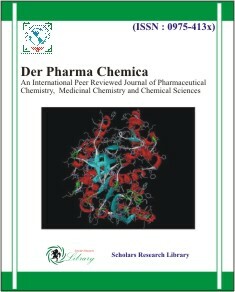 In search of finding new resources and potent antioxidant to protect human tissues and cells exposed to external aggressions (environmental stress), the present study aimed to: (1) Chemical synthesis and characterization of some α-aminophosphonate derivatives 4 (a-d); (2) evaluate the antioxidant potential of these products in vivo by using Tetrahymena cells treated respectively with H2O2 and SNP. 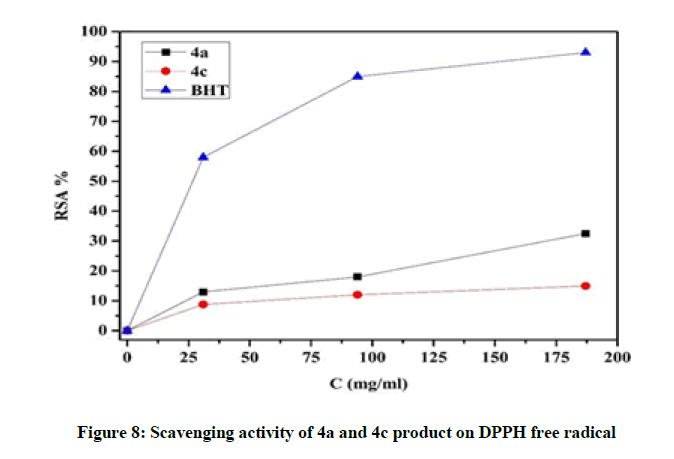 (2) Investigate the antioxidant behavior of the 4a and 4c product in vitro using DPPH and Dienes conjugated assay. 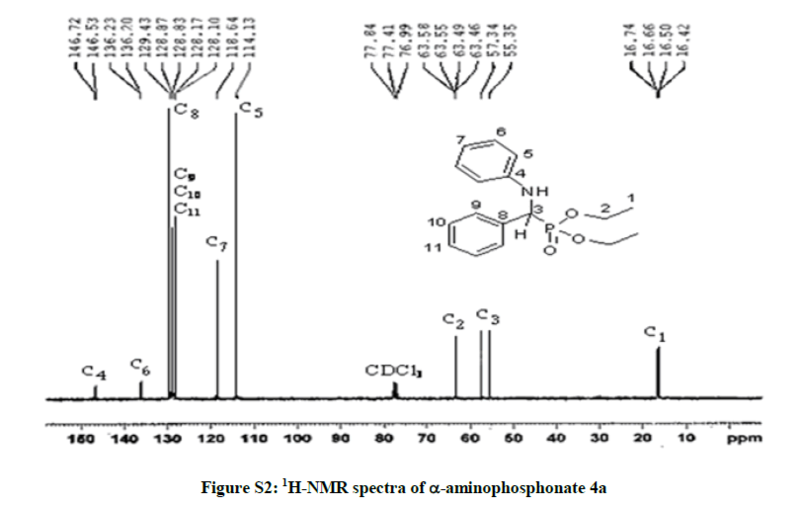 The melting point of the α-aminophosphonate derivatives were detected on Buchi 510 Melting point apparatus B510 K. The NMR spectra of 1H and 13C were detected and recorded on Bruker TM 300 MHZ by using the internal standard CdCl3. The chemical shifts (δ) are expressed in ppm and coupling constant (J) expressed in Hertz units. IR spectra were performed as KBR pellets on FTIR (IR Affinity-1S, Fourier Transform Infrared Spectrophotometer, SHIMADZU). The purification was performed on silica gel used as adsorbent in the column chromatography. 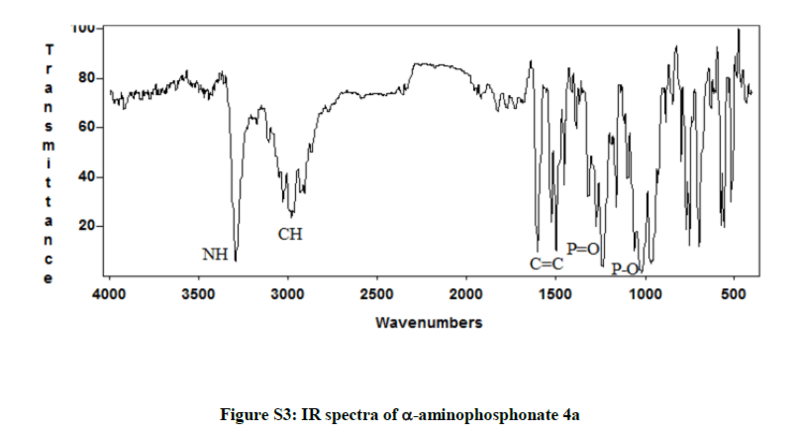 The α-aminophosphonate (4) were synthesized via the methods reported in literature , this is method is summarized in Figure 1. The equimolar mixture of aromatic aldehyde 1 (1 mmol), aniline 2 (1 mmol), and diethyl phosphate 3 (1 mmol), was prepared in presence of Na2CaP2O7 catalyst (0.3 g), The completion of this reaction was performed by thin layer chromatography on the silica gel after 7 h, then visualized on UV at 254 nm. After the process of filtration using the hexane/ EtOAc (1/4), the crude product was obtained with high yields: 80-91% [18,19]. 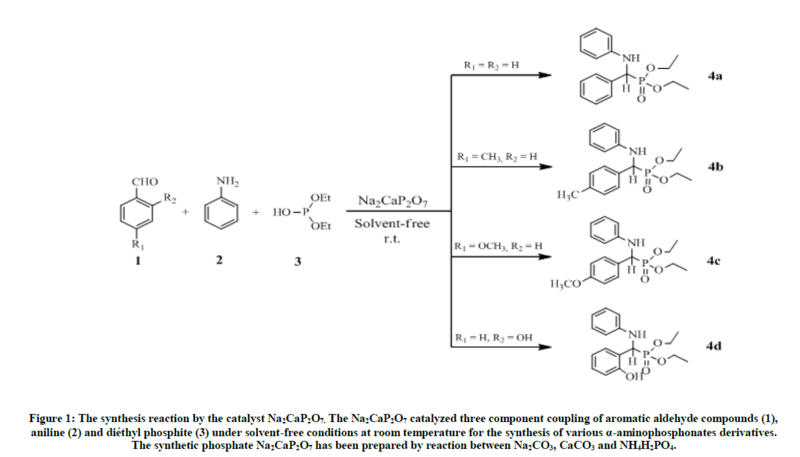 Figure 1: The synthesis reaction by the catalyst Na2CaP2O7. The Na2CaP2O7 catalyzed three component coupling of aromatic aldehyde compounds (1), aniline (2) and diéthyl phosphite (3) under solvent-free conditions at room temperature for the synthesis of various α-aminophosphonates derivatives. The synthetic phosphate Na2CaP2O7 has been prepared by reaction between Na2CO3, CaCO3 and NH4H2PO4. The two protozoa are grown axenically at a temperature of 28°C for Tetrahymena pyriformis and 30°C for Tetrahymena thermophila without stirring for 72 h in the liquid medium (PPYE), this medium contains 1.5% (w/v) of peptone and 0.25% (w/v) of yeast extract . To follow the growth of Tetrahymena, we measured absorbance at 600 nm each 24 h using the UV-Visible Spectrophotometer. In order to study the morphology and the mobility of Tetrahymena, an aliquot of 1 ml was taken immediately, then samples were fixed with neutral buffered formalin, which is prepared at 2% in phosphate buffer saline: PBS , finally 6 μl of suspension were taken to make the visualization under light microscope: A. KRÜSS Optronic optical microscope (objective × 10). All the experiments shown in this paper were carried out at least in triplicate or more. To evaluate the effects of the SNP and H2O2 on the growth of Tetrahymena, erlenmeyers flasks containing the PPYE medium are inoculated with 1% (v/v) of Tetrahymena protozoan (thermophila or pyriformis), while cultures were supplemented with IC50 of stress agents after 24 h of cell growth. Then Protozoan growth was monitored by sterile sampling every 24 h, and the absorbance of Tetrahymena was measured at 600 nm for 120 h . Simultaneously, a negative control was prepared in the same condition without stress in order to follow the normal growth of Tetrahymena . The IC50 used in this experiment are determined in Table 1. The products 4 (a-d) are prepared at the finale concentration of 25 mg/ml in DMSO (0.1% v/v), and a concentration range is performed via serial dilution of 10-1 to of 10-4. After 3 days of cells culture in the PPYE medium supplemented with 5 μl of each dilution, we detected the concentration that did not affect the growth or the morphology of Tetrahymena cells; it's the non-lethal concentration (Table 2). As: is the absorbance of the samples. During the formation of hydroperoxydes throughout the peroxidation of lipids, conjugated dienes (CDs) are typically produced . To follow the processes of CDs formation we measured the absorbance at 234 nm. The increase of optical density correlates with the appearance of these products. The progress of this biochemical reaction is carried out by preparing a mixture of linoleic acid (7.5 mM) with 10 mM of tween 20 (0.1 v/v %), this mixture is prepared in phosphate buffer (pH=7) and incubated with each compound at a final concentration of 25 μg/ml to 180 μg/ml. Oxidation reaction is initiated by using 10 μM of CuSO4 freshly prepared; while to stop the oxidation we use an ice bath containing the solution of EDTA (100 μM) and BHT (20 μM). A positive control is carried out by using the BHT (Esterbauer and Cheeseman, 1990; Filali- Ansari et al., 2016). Diethyl phenyl (phenylamino) methylphosphonate 4a: White solid. m.p. 92°C-94°C; Rf (35% AcOEt/hexane) 0.38; 1H-NMR (CDCl3) δ (ppm)=1.2 (3H, JHH=7.2 Hz, t, OCH2CH3); 1.4 (3H, JHH=7.2 Hz, t, OCH2CH3); 3.73-4.3 (4H, m, OCH2CH3); 4.9 (1H, JHP=24.6 Hz, d, CHP), 5 (1H, s, NH); 6.6-7.8 (10H, m, HAr); 13C-NMR (CDCl3) δ (ppm)=16.46 (d, 3JCP =6.03 Hz, OCH2CH3); 16.7 (d, 3JCP=6.03 Hz, OCH2CH3); 56.35 (d, 1JCP =149 Hz, CHP); 63.5 (d, 2JCP =6.79 Hz, OCH2CH3); 63.53 (d, 2JCP=6.79 Hz, OCH2CH3); 114.13 (s); 118.64 (s); 128.1 (s); 128.85 (s); 129.43 (s); 136.2 (s); 146.6 (s); IR (KBr) υ 3304(NH), 2985(CH), 1605 (C=C), 1514 (C=C), 1240 (P=O), 1020 (P-O) cm-1. Diethyl 4-methylphenyl(phenylamino)methylphosphonate 4b: White solid. m.p. 63°C-65°C; Rf (35% AcOEt/hexane) 0.4, 1H-NMR (CDCl3) δ (ppm)=1.25 (3H, JHH=7.2 Hz, t, OCH2CH3); 1.4 (3H, JHH=7.2 Hz, t, OCH2CH3); 2.45 (3H, s, C6H4CH3); 3.79-4.31 (4H, m, OCH2CH3); 4.87 (1H, JHP=24.6 Hz, d, CHP), 5 (1H, s, NH); 6.71-7.5 (9H, m, HAr); 13C-NMR (CDCl3) δ (ppm)=16.5 (d, 3JCP = 5.8 Hz, OCH2CH3); 16.71 (d, 3JCP=5.8 Hz, OCH2CH3); 21.4 (s, C6H4CH3); 56 (d, 1JCP=150 Hz, CHP); 63.48 (d, 2JCP =6.94 Hz, OCH2CH3); 114.14 (s); 118.57 (s); 128 (s); 129.4 (s); 129.55 (s); 129.58 (s); 133 (s); 137.8 (s);146.8 (s); IR (KBr) υ 3325 (NH), 2980 (CH), 1604 (C=C), 1498 (C=C), 1234 (P=O), 1016 (P-O) cm-1. Diethyl 4-methoxylphenyl(phenylamino)methylphosphonate 4c: White solid. m.p; 102°C-103°C; Rf (35% AcOEt/hexane) 0.26; 1H-NMR (CDCl3) δ(ppm)=1.25 (3H, JHH=7.2 Hz, t, OCH2CH3); 1.39 (3H, JHH=7.2 Hz, t, OCH2CH3); 3.86 (3H, s, C6H4OCH3); 3.8-4.26 (4H, m, OCH2CH3); 4.85 (1H, JHP=23.1 Hz, d, CHP), 4.95 (1H, s, NH); 6.7-7.53 (9H, m, HAr); 13C-NMR (CDCl3) δ (ppm)=16.53 (d, 3JCP=5.7 Hz, OCH2CH3); 16.72 (d, 3JCP=5.7 Hz, OCH2CH3); 55.44 (s, C6H4OCH3); 55.62 (d, 1JCP=151, 2 Hz, CHP); 63.43 (d, 2JCP=6.9 Hz, OCH2CH3); 63.47 (d, 2JCP=6.9 Hz, OCH2CH3);114.15 (s); 114.32 (s); 118.57 (s); 128 (s); 129.2 (s); 129.33 (s); 146.67 (s); 159.56 (s); IR (KBr) υ 3300 (NH), 2983 (CH), 1600 (C=C), 1510 (C=C), 1232 (P=O), 1020 (P-O) cm-1. 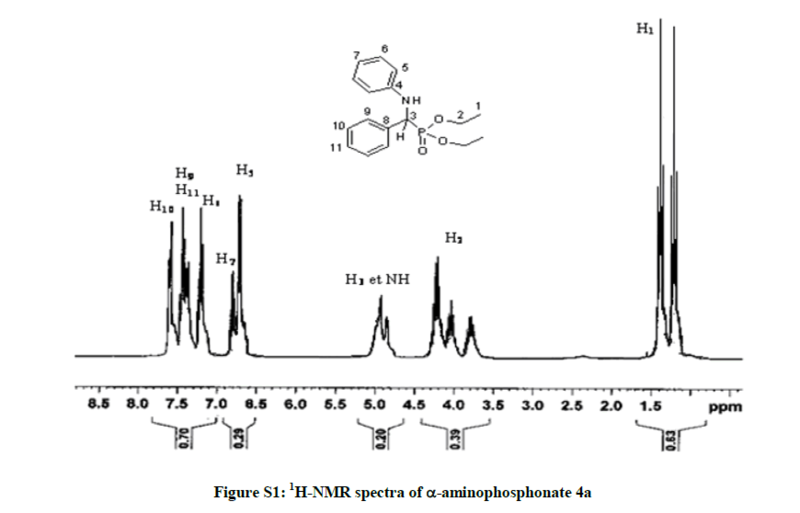 Diethyl 2-hydroxylphenyl(phenylamino)methylphosphonate 4d: Rf (35% AcOEt/hexane) 0.23; 1H-NMR (CDCl3) δ (ppm)=1.1 (3H, JHH=7.2 Hz, t, OCH2CH3); 1.25 (3H, JHH=7.2 Hz, t, OCH2CH3); 2.2 (1H, s, C6H4OH); 3.84-4.18 (4H, m, OCH2CH3); 5.01 (1H, JHP=23.1 Hz, d, CHP), 5 (1H, s, NH); 6.59-7.19 (9H, m, HAr); 13C-NMR (CDCl3) δ (ppm)=16.52 (d, 3JCP=5.7 Hz, OCH2CH3); 16.68 (d, 3JCP=5.7 Hz, OCH2CH3); 54.25 (d, 1JCP =151, 6 Hz, CHP); 63.91 (d, 2JCP=7 Hz, OCH2CH3); 64.42 (d, 2JCP=7.2 Hz, OCH2CH3);114.15 (s); 114.77 (s); 118.65 (s); 119.63 (s); 120.94 (s); 121.9 (s); 129.55 (s); 146.5 (s); 159 (s); IR (KBr) υ 3300 (NH), 2983 (CH), 1600 (C=C), 1510 (C=C), 1232 (P=O), 1020 (P-O) cm-1. Effect of stress on Tetrahymena morphology: The results of Figure 2 showed clearly that the two protozoa react differently depending on the types of stress (oxidative or nitrosative). The behavior of Tetrahymena pyriformis against this two stress reagent demonstrates that this organism is more sensitive to the SNP; nevertheless the cells' sensitivity to hydrogen peroxide (H2O2) is appreciated with Tetrahymena thermophila. Otherwise, our data indicated that the stress manifested by a decrease of protists number with a notable increase of its size and its interior volume; we also spot the appearance of dark vacuoles. 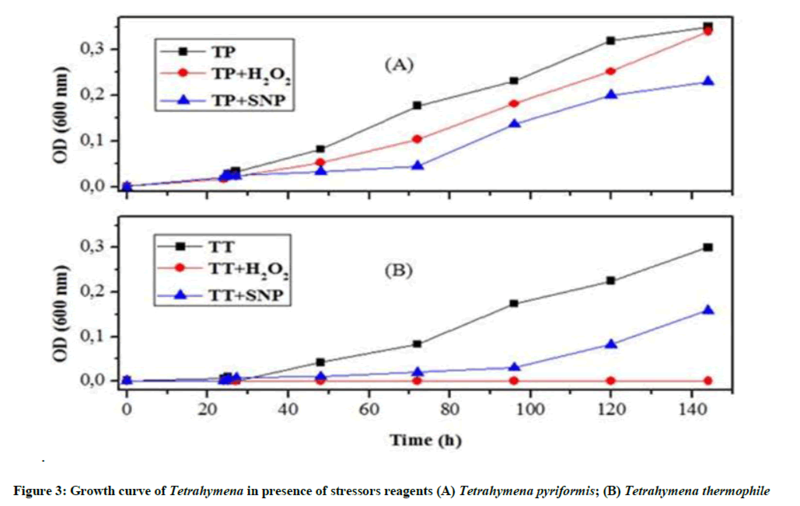 Effect of stress on the growth of T. thermophila and T. pyriformis: The results shown in Figure 3A reveal that the protozoan T. thermophila is able to fight against nitrosative stress, but not against oxidative stress. SNP-treated cells could turn to their normal shape. However, H2O2-treated cells stills unable to overcome this oxidative stress. As shown in Figure 3B, the characteristic growth curve of Tetrahymena was drastically modified after the induction of oxidative stress. However, Tetrahymena pyriformis cultivated with the IC50 of H2O2 does not show a very strong decrease, after 72 h we found that the curve shape is nearly similar to the controls. Anti-oxidative and nitrosative potential of 4a product on Tetrahymena: In this current study it was reported that 4a product has an impressive effect against oxidative stress. The addition of 4a product to the culture stimulates the growth of stressed protozoan and their growth curve becomes similar to the typical shape of normal Tetrahymena (Figure 4). On the other hand, we find that the 4a product is enabled to protect against the nitrosative stress, because the addition of 4a product to the culture medium protects T. thermophila against the RNS produced in vivo. Furthermore Tetrahymena pyriformis is influenced also by this compound; and sometimes it gains to exceed the growth curve of the normal protozoan (Figure 5). Anti-oxidative and nitrosative potential of 4c product on Tetrahymena: The protective effect of the 4c compound is more appreciated with Tetrahymena pyriformis. We observed that this 4c product controls the stress and activate the growth of this ciliated protozoan (Figure 6), especially in the presence of nitrosative stress (Figure 7). Our investigations on the antioxidant potential show that the 4a product has a positive effect and good ability to control the overproduction of RNS, whereas 4c product could be used as an ideal tool to overcome the oxidative stress. DPPH assay: As shown in Figure 8 all the tested compounds showed a significant (p<0.01) scavenging effect on the DPPH radical. At the maximal concentration (180 μg/ml), we notice that 4a compound showed the highest activity followed by 4c compound, but the BHT still the most potent antioxidant compared to the other samples. In order to estimate the antioxidant potential of the isolated compounds during the primary oxidation of lipid, the inhibition of the linoleic acid peroxidation was quantified at various concentrations (25-180 μg/ml). 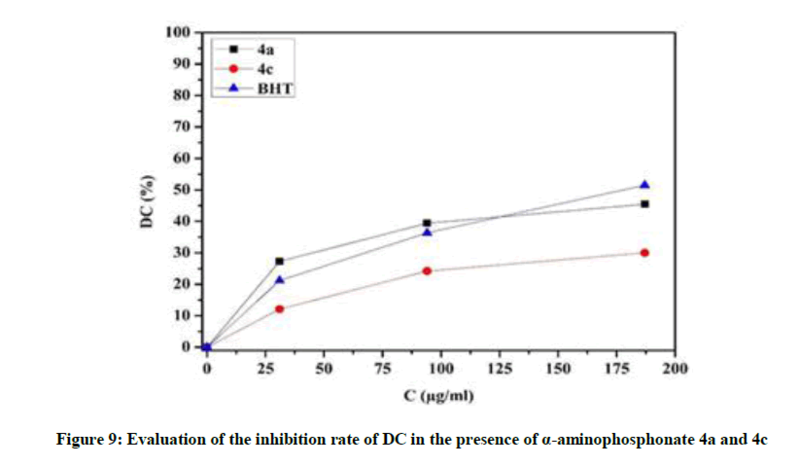 As shown in Figure 9 the two α-aminophosphonate derivatives 4a and 4c showed significantly (p<0.05) inhibitory potential products on DCs production. The maximum inhibitory potential was obtained at concentration of 180 μg/ml (Figure 9). Our results revealed that Tetrahymena exposed to oxidative or nitrosative stress induce the cell damage and perturbed some physiological and morphological parameters of this protozoan. Similar effects have been observed in Tetrahymena pyriformis cells treated with ethidium bromide , we notice that the morphology of the treated cells was markedly altered, the cortex was greatly distorted and the cells assumed a variety of weird shapes. Besides that the cells can’t swim effectively, but turned erratically . The stress is defined as the imbalance between the free radicals and antioxidant system (non enzymatic and enzymatic), it becomes a pathological situation when our antioxidant system is submerged by ROS and RNS; especially when this defense system is unable to quell these free radicals or to limit their reactivity by converting this reactive species to non-reactive one. Therefore, their overproduction affects cell metabolism and induces cellular, molecular, and chemical modification of 3 basic biomolecules: proteins, DNA (chromatin) and lipids [26,27]. To evaluate the toxicity of oxygen and oxide nitric on Tetrahymena cells, we used two stress reagents: H2O2 as donor of oxygen, and the SNP as a donor of nitric oxide [28,29]. Our data indicated that the two stressors acted differently depending on the type of protozoan: T. thermophila or Tetrahymena pyriformis, but both inhibited the growth of this protozoan, and caused Tetrahymena mortality especially the SNP. Otherwise, our microscopic results have confirmed that stress conditions induce important changes in the cell structure as we show above in this work. Occasionally we observed cells, which had initiated division cycle but did not complete cytokinesis, and we noticed the appearance of some erratic cellular forms: elongated or rounded, these forms related to the activation of autophagy that manifested by damage of some organelles, sequestration of proteins, alteration of DNA and finally apoptosis . Overall several studies were previously confirmed that the induction of oxidative stress via H2O2 suppressed the growth of some organisms such as Yarrowia lipolytica and Pichia pastoris [30,31]. The broad use of plants and their essential oil in biomedical research is due to their biological properties and their therapeutic benefits, unfortunately their minimum amount and difficulty of extraction, have oriented the biologists to finding new complementary approaches to aromatherapy, for example the study of natural molecules generated by synthesis and hemisynthesis . 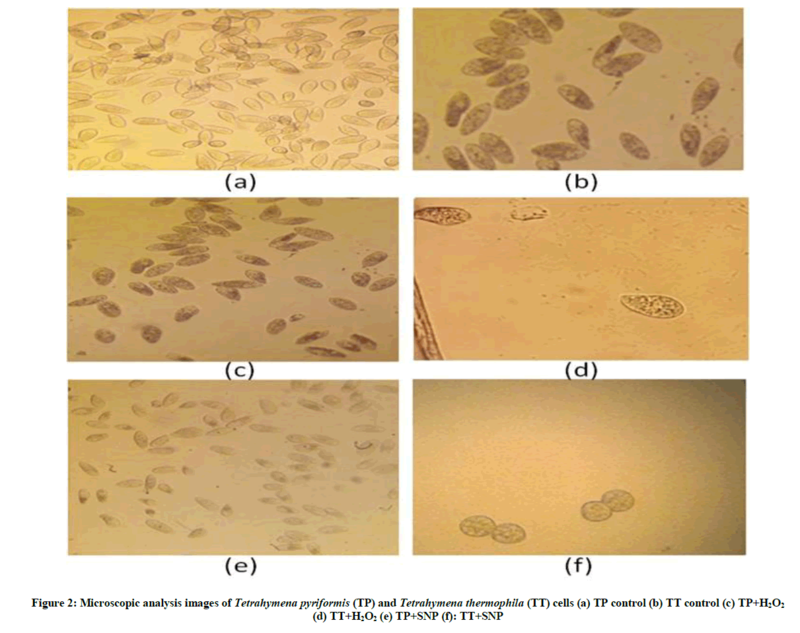 This paper presents a preliminary study describing the antioxidant potential of some α-aminophosphonate derivatives against oxidative and nitrosative stress using as experimental model, the protozoan Tetrahymena. The aim of our work was to investigate the possibility to use these organophorus derivatives as new anti-stress compounds. To remedy the cell damage induced by stress reagent , we worked under in vivo and in vitro conditions. Therefore, to enhance the protective behavior of these organophosphorus compounds against stressors reagent, we used a non-lethal concentration of this product. This test leads us to follow their antioxidant effect without damaging Tetrahymena cells or influencing the viability of this organism: it’s the turbidity test. 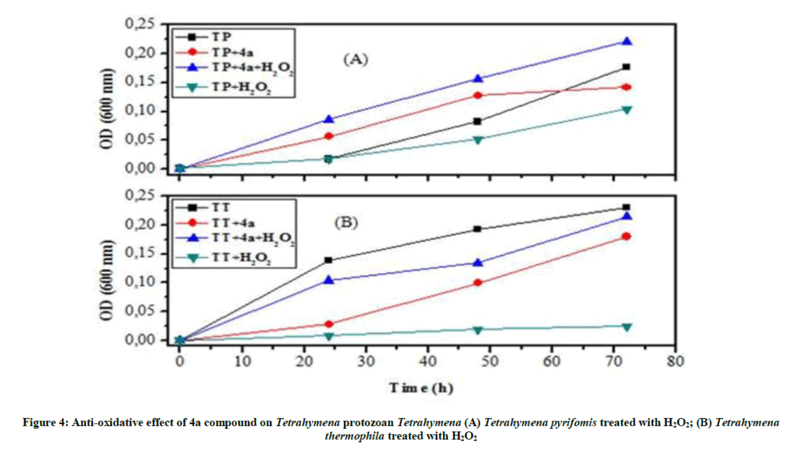 Our results indicated that 4a product protect Tetrahymena cells against H2O2, by increasing protozoan growth and maintaining the normal form and mobility of this ciliated protozoan. However the 4c product behaves against the SNP by protecting the normal form of Tetrahymena cells. The protective potential of 4a product is related to the capacity of trapping ROS directly or indirectly by inducing the production of some enzymes that play a key role in the cellular defense pathway, such as catalase (CAT), Superoxide dismutase (SOD), glutatione reductase (GR) and gluthatione-S-transferase(GSt);These antioxidant enzymes maintain our health by inducing the defense pathway [32,33]. The protective effect of 4c compound is due to their capacity to regulate the nitric oxide metabolism, this NO reacts quickly with superoxide radical to produce peroxynitrite (ONOO−), the unstable form of peroxynitrite radical exhibit many cytotoxic effects in vivo such as apoptosis and necrosis . Indeed the accumulation of NO induces the appearance of the redox form of this enzyme its: the S-nitrosoglutathione (GSNO), this form inhibits the GAPDH protein by the S-nitrosylation. The negative regulation of this glycolitic enzyme can influence some physiological parameters in Tetrahymena cells, such as: the morphology, mobility and growth kinetic of this protozoan [21,35]. The in vitro study is carried out to clarify the protective effect of the α-aminophosphonate against two types of stress: oxidative and nitrosative. Our data elucidate that the two compounds 4a and 4c limited the circulation of ROS and RNS, and behaves as antioxidant during the primary lipid oxidation [36-38]. In this in vitro study, we used BHT as control to evaluate the antioxidant behavior of these products; This BHT is used in food industry as additive due to their potential to control the circulation of ROS and to suppress the oxidation process . Ultimately what remains to be done in this work is to detect cellular constituents targeted by these compounds such as proteins or enzymes, eventually we should try to assess their mechanism of action in vivo , in order to use these compounds in the future as new sources of low cost antioxidant. The α-aminophosphonates derivatives 4 (a-d) have been synthesized in good yields 80-90% and displayed high antioxidant activity especially the 4 a and 4 c products. The 4a is a potent compound that can suppress the oxidative stress, whereas the 4 c compound had a antioxidant activity against the nitrosative stress. Therefore, we elucidate that these bioactive compounds can be used in the future for the drug industry as new anti-stress agents. This work was supported by the CNRST (Moroccan research center of science and technology) under the Research Excellence Scholarship Program. K. Devarayan, Y. Sathishkumar, Y.S. Lee, B.S.Y. Sathishkumar, PloS One, 2015. GS. Prasad, GN. Rao, Molecules., 2013, 1, 49. Y.P. Lv, X.Y. Wang, B.A. Song, Molecules., 2007, 12, 695. B.A. Song, Y.L. Wu, S. Yang, D.Y. Hu, X.Q. He, L.H. Jin, Molecules., 2008, 8, 192. A.B. Krishnaa, M.V.N. Reddya, G.C.S. Reddya, B.S. Krishnaa, S.K. Nayakb, C.S. Reddy, Int. J. Appl. Biol. Pharm. Technol., 2010, 1, 882. Y. Morel, R. Barouki, Biochem. J., 1999, 342, 481. S. Suzen, H. Gurer-Orhan, L. Saso, Mol. Basel. Switz., 2017, 1, 22. S.W. Zhang, J.N. Feng, Y. Cao, L.P. Meng, S.L. Zool Res., 2015, 36, 167. W. Pauli, S. Berger, Chemosphere., 1997, 35, 1043. C.J. Fu, T. Yu, W. Miu, Y.F. Shen, Chin. J. Zool., 2005, 40, 108. A.G. Huang, X. Tu, L. Liu, G.X. Wang, F. Ling, Environ. Toxicol. Pharmacol., 2016, 41, 211. A. Nicolau, J.N. M, Mota. N, Lima. Meng, FEMS. Microbiol. Ecol., 1999, 30, 209. G. Csaba G, Acta Microbiol. Immunol. Hung., 2012, 59, 131. M.D. Ruehle, E. Orias, C.G. Pearson, Genetics., 2016, 203, 649. D.N. Wheatley, L. Rasmussen, A. Tiedtke, BioEssays., 2005, 16, 367. M. Zahouily, A. Elmakssoudi, A. Mezdar, A. Rayadh, S.S. Lazrek and B, Lett. Org. Chem., 2005, 16, 131. B. Belhani, B. Malika, M. Le Borgne, Z. Bouaziz, J. Lebreton, A. Nour-Eddine, RSC Adv., 2015, 5, 39324. C. Rodrigues, M.L. Pousada, D. Cyrne, Z. Hayes, Eur. J. Biochem., 1979, 102, 389. P.D. Mar, B. El khalfi, J.R. Perez.Castiñeira, A. Serrano, A. Soukri, Adv. Biosci. Biotechnol., 2017, 08, 415. N. Errafiy, A. Soukri, Acta Biochim. Biophys. Sin., 2012, 44, 527. 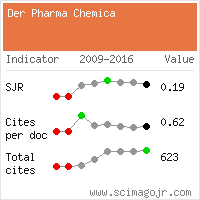 N.Filali.Ansari, A.El Abbouyi, A. Kijjoa, S. el maliki, S. El Khyari, Der Pharma Chemica., 2016, 8(4),338. J. Azarnia Mehraban, M. Sadat Jalali, A. Heydari, Chem. Pap., 2018. A. Krasowska, K. Sigler, Folia Mcrobiol., 2007, 52(6), 585. R. Meyer, C.R. Royd, D.C. Rein, S.J. Keller, Cell Res.,1972, 70, 233. M.N. Alam, N.J. Bristi, M. Rafiquzzaman, Saudi Pharm. J., 2013, 21, 143. U. Asmat, K. Abad, K. Ismail, M. Rafiquzzaman, Saudi Pharm. Soc., 2016, 24, 547. ]L. Grossi, S. D’Angelo, K. Ismail, J. Med. Chem., 2005, 48, 2622. M. Zappi, K. White, H.M. Hwang, R. Bajpai, M. Qasim, J. Air Waste Manag. Assoc., 2000, 50, 1818. E.N. Biryukova, A.G. Medentsev, A.Y. Arinbasarova,V.K. Akimenko, Microbiolog., 2006, 75, 243. M. Lopes, M. Mota, I. Belo, Appl. Biochem. Biotechnol., 2013, 170, 448. M.M. Azaam, E.R. Kenawy,A.S.B. El-din,A.A. Khamis, M.A. El-Magd, J. Saudi. Chem. Soc., 2018, 22, 34. M.E. Inal, G. Kanbak, E. Sunal, Acta Int. J. Clin Chem., 2001, 305, 80. J.S. Beckman, T.W. Beckman, J. Chen, P.A. Marshall, B.A. Freeman, Proc. Natl. Acad. Sci., 1990, 87, 1620. Y.J. Wan, Y.S. Ho, M.H. Pan, J.K. Lin, Environ. Toxicol. Pharmacol., 1998, 6, 35. A. Wageeh, R. Noorsaadah Abdul, A. Azhar, H. Sharifah Bee Abd, A. Abeer,A.K. Farkaad, Molecules., 2015, 101, 295. M.S. Blois, Nature., 1958, 181, 1199. G. Subba Reddy, K. Uma Maheswara Rao, C. Syama Sundar, S.S. Sudha, B. Haritha, S. Swapna, Arab J Chem., 2014, 7, 833. R. Xiaoping, Z. Song, L. He, Heteroatom Chemistry., 2008, 19, 5.